There's no doubt that we’re very excited! 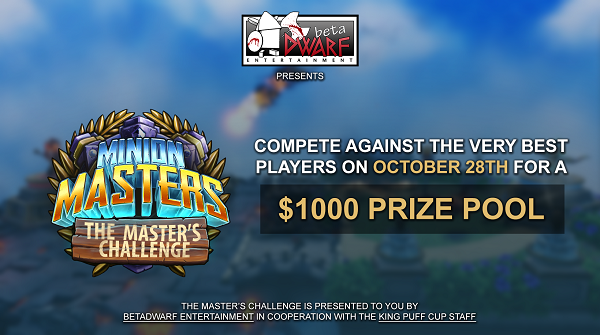 The Master’s Challenge is our first own tournament and we’re proud to present you a roster of participants that promises finest gameplay as well as thrilling matchups. Thanks to everyone participating & supporting The Master’s Challenge! 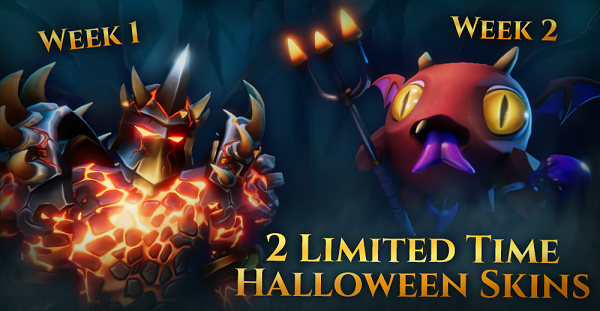 Please note, that you are still able to sign up until Friday, October 27th at 1pm CEST! To do so, here you go! The group stage will be casted on Sunday 28th at 3pm CEST live on Twitch! This time, Dipshit will be joined by one or more special guests. For instance, BetaDwarf's CEO Baboonlord will join Dipshit for some games! The final stage will be casted on Monday 29th at 7pm CEST live on Twitch! Update 49 hit last Wednesday. There were a lot of changes introduced, but also Skins and a brand new Expedition map! Sadly, we see the community being frustrated about some of the changes. We’re listening, watching and feeling you! We’re still open for feedback (good or bad), suggestions and adjustments. We're not just sitting around, but are working hard on adjustments. Our team has discussed changes, taking feedback and various suggestions into consideration. We already announced some of our future adjustments here. Additionally, we will go into more detail in our Monday blog post. Please do continue to give us feedback and suggestions, let us know your results from Expeditions via Discord, Steam forums or Reddit! But please do so in an objective manner and detailed. That one sentence: “These changes are just bad” reflects your thoughts and feelings, but doesn’t give us a lot to work with. That being said, we’re looking forward to your thoughts, feedback and discussions! Hey Salbei, nice to have you! You’re a known streamer in our community, but for those who still don’t know you, would you introduce yourself please? My name is Sebastian, am 35 years old and live in Germany. I picked up Minion Masters around March and immediately got hooked. I just could not stop learning and improving. The game really rewards you for smart decision making and skill intense timings and even after my roughly 1000 hours into the game I still learn new tricks and interactions! I started streaming my daily sessions about 3 months ago and fortunately became quite popular in the community. One day Sinilil (you probably know him from casting the King Puff Cup) approached me with the idea to broadcast our own Minion Masters league. We started to toy around with the idea, got PalaceOfDreams (an insightful, high level player) on board to do the casting and here we are now. You’re running the Monday Night Masters for the 4th week now. Could you explain what it is? Right now we are broadcasting a trial run of the planned league, and yet we managed to get 18 high profile players to provide us with entertaining games. We held a survey among those players if we need to ban potentially problematic cards, but ended up without any bans – so the tournament is as competitive as possible without any restrictions. Due to the nature of the format you will not get away with playing only one deck all the time. The players are aware what the opponents played in the past, and thus are able to react with their deck choice, to potentially counter what they expect to see. This also adds another layer of strategy. ShadyHobos for example is known for his triple Zeppelin cheese deck – which usually wins because of the combination of a timed push plus the surprise factor. The Poker term “going ALL IN!” describes this pretty well. What new does the Monday Night Masters bring to the competitive scene around Minion Masters? The one big edge we got over the other competitive Tournament names in the Minion Masters scene is our preparation time. Since players have about a week of time to play their game, it is a lot easier to overcome scheduling issues, which usually are problematic. Also we have more time to prepare the visuals for the show this way. I can spend about 4 days of work to prepare the show – and people really appreciate the extra effort spend towards the small animations, videos and on-screen deck lists. Let’s take a look in the future: What do you guys plan for the Monday Night Masters? The initial idea was to create a League style tournament where the participants battle each other weekly. Just like a football or soccer league. Right now we are still experimenting with the format, while also trying to figure out how much workload the players and our team can handle. We decided to set the initial hurdle low for the trial run, but we can definitely branch out bigger from here. My dream would be to broadcast the show multiple times a week. I already asked Dipshit that: Where do you see Minion Masters in 2 years? Minion Masters is highly skill intensive and very enjoyable to watch being played on a high level. It has got huge potential to become the next big thing in the eSport scene, since it is highly accessible for the masses and easily observable. This is its major strength in my eyes. Everybody can follow what is happening on the screen – even people who never played the game themselves can understand what is going on and get immediately hooked. I am certain the game will become a smash hit! Thanks for the interview, Salbei! If you want to leave some shout-outs, feel free to do so. Thanks to B4dhabit – wherever you may be now. Back in the day he was streaming and helped me to understand the game. Go check out his YouTube channel and his tutorials. Decks in there are outdated by now, but he still did a fantastic job explaining the basic principles of the game to us. Of course a shout-out to FFA, Dipshit and their King Puff Tournament! You guys do an ungodly amount of work in just 2 days of time and I highly appreciate your work! My Casters Sinilil and PalaceOfDreams, and of course the MNM Participants for providing us with those amazing games! You guys rock! I would also really like to thank my fellow Twitch streamers Videogamer77 and ShadyHobos for all the kind words and moral support. Go check em out! Oh and BetaDwarf for creating this amazing game! Let's leave it at that. We wish all of you a nice weekend and are looking forward to The Master's Challenge!